We went to a local diner yesterday – Ludi’s downtown which somehow I hadn’t realized existed and they are good and cheap. One of their specials was ube pancakes with haupia syrup. But they were out. But this made me realize this morning that I could easily make coconut waffles with what we had in the kitchen! Some months ago a coworker mentioned their partner making them Dutch baby pancakes for a special day. I was intrigued and googled, stashing away this Alton Brown recipe. A few weeks ago I finally made it in a 9 inch pan for family breakfast (partner, kiddo, my mom and me). They were delicious but somewhat awkward to make seconds. I made up a batch, we baked it, divided into quarters and repeat. Awkward. But! I have tiny cast iron pans! They are adorable little six inch diameter pans. So I adapted the recipe to work with the small pans! And it worked spectacularly. The only “problem” now is we only have two 6-inch cast iron and to do it right for a group needs more pans! Read inside for converted recipe! My mom topped hers with homemade applesauce and dehydrated apple peel! You may not actually know the name of this “salad”, but it’s that one with usually fruit and marshmallows and jello probably in a creamy base. Good ones have a variety of fruit and some coconut. Bad ones are mostly incredibly sweet creamy fluff with marshmallows and jello and if you’re lucky some fruit. I had a craving so we made some for the family holiday party after I found a Serious Eats article about the history of it. 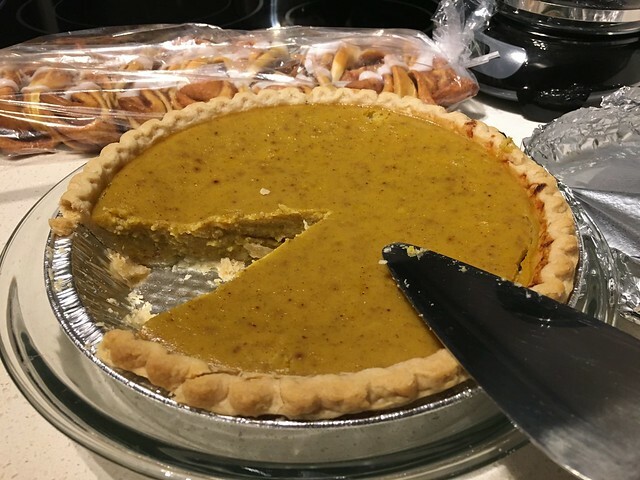 The short version is that originally – in the 1800s in the south of the United States – it was just fresh citrus, shredded coconut and a bit of sugar. Those ingredients would all be seasonal or rare treats then, even if now they are ubiquitous and often available year round. The marshmallows and creamy base came later. The cream base is varyingly cream, marshmallow fluff, cool-whip, sour cream, mayonnaise (!) or a mixture, often along with jello. Maraschino cherries, nuts and marshmallows pieces are also more modern. If you’ve ever heard of Cincinnati Chili you probably know it’s not really chili. It is neither the bean heavy stew or the meat and spice version. It is however delicious and I haven’t had it in ages. You can do an internet search, but in short it’s a meat and spice heavy sauce served over pasta, almost always spaghetti, with cheese (and often onions and beans). Wikipedia has a long section on how it is made in different “ways”. My family used to make it at home but I never got the recipe and I think it is lost to time. But I found a recipe a while ago that fairly well matches my recollection of the ingredients. Tonight we made some (with heavy modifications for our cabinet and to make it vegetarian). These started from the recipe I found but modified heavily from my memory and our kitchen contents. The main differences here are I scaled this down to the amount of “ground beef” we had on hand and I adjusted a bunch of spices based on what I remember (and what I know I like). The main changes here is I put in a lot more of most spices (other than chili powder) than the linked recipe calls for. Cook the onion in oil (say olive oil and coconut oil for that saturated fat goodness). Add the dry spices (except bay leaf) and let cook in oil. Add “ground beef”, liquid spices, garlic, bay leaf, stock and tomato sauce. Let it cook down for a while. It did not take hours like the above recipe to get to the texture I wanted (chunky and not too runny). Meanwhile, grate some cheddar, dice up some onions and cook some beans (we’re making five-way, though normally I think you’d see red or kidney beans). When the main sauce is nearly done, cook some pasta. We made elbows because that’s what we have (and rice noodles seemed a bit too far), but long spaghetti is traditional. 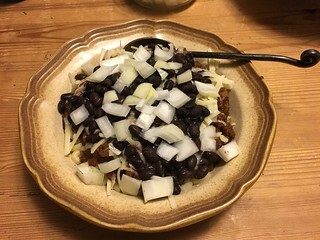 Serve some pasta in each bowl, add the main chili on top, then sprinkle a bunch of cheese, beans and onions. Enjoy! Yes, this doesn’t look like much. But it was really tasty and very similar to what I remember. The “beef” was a good texture. If we make it again we might add even more spice (not just chili powder) and I should have chopped up the onion for the topping smaller. But still mmmmmm tasty.